Buddy was a big, good looking, gentle, well bred four year old gelding I was riding for my Dad through calving one spring. I’d used him all winter and had packed my little nephew on him and even pulled him in the sled, so he was pretty solid in most ways and really lazy. It was the usual windy, muddy April when I rode out through the springers on my way to go do some other horseback chores before gathering them for the night. There was a first calf heifer in the bunch that had a calf that was several days old and hadn’t quite gotten going so the little pair had been left in the calving pasture for closer monitoring. On my way by I had found this calf to be plumb down and putting in his resignation from a nasty case of scours. I finished up my other riding and thought I’d just pack the sick calf home and bring his mama in with the springers, thus saving myself another trip out. Buddy had put in a decent circle and was sweated up and pretty tired from slogging through the gumbo. I got off next to the calf and easily scooped his 60 pounds into my arms and laid him across the front of my saddle. The calf appeared dead and never even opened his sunken eyes. I stepped up on Buddy and just as I swung my leg over and reached for my stirrup, Buddy woke up and pulled the plug. He went straight in the air and we may have disrupted duck migration before coming back down. He bucked high, wide and handsome all over that little spot, bawling and tearing up the sod. I was still in the middle of him but was combing his mane and anything else I could lay hold of to stay there while my off stirrup tried to beat me to death. On about the second really high jump, the little calf became airborne, which though hard on the calf, made getting Buddy rode through the storm a lot easier. I finally got his head pulled up and he stopped, all spraddled out and gasping for air. I was in the saddle, but everything on my saddle or in my pockets was scattered over about three acres. I stepped off to gather up my plunder, my rope and my other bridle rein. The little calf was in a heap, just the way he landed from what seemed like 30 feet in the air. I was mad clear through. I was absolutely determined that Buddy was going to pack me AND the calf home if it was the last thing he ever did. So, I picked up my hat, crammed it down on my head, and stomped over to the calf. He opened the eye I could see and watched me approach. Just as I got to him and started to bend over to pick him up, he bellered, staggered to his feet and listing like a drunk, toddled off after his very concerned mother. I just watched him. It had sure perked him up and he trailed in with his mama and the springers. Since it looked like he might live, I decided to forego killing him off with another bronc ride and let him go. I stepped back on Buddy and we loped circles in the mud all the way in behind the springers, so I kind of got even. That wasn’t the only time he ever pulled a stunt like that on me and I never forgot just how fast he could change gears from plug to bucking horse. 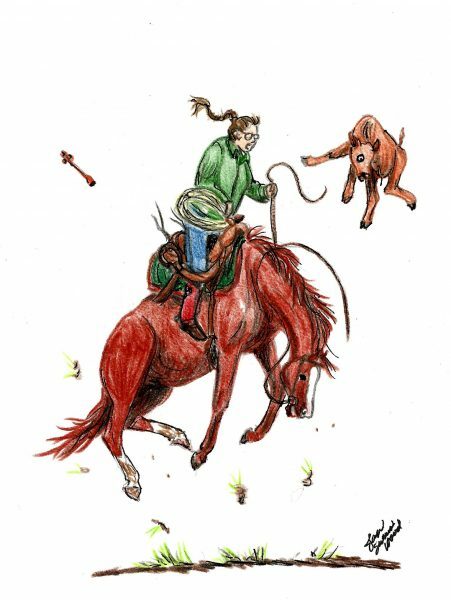 Oh, the calf lived and as far as I know, never rode another bronc.